First, let’s clarify the terminology: “Contract Restoration” means full restoration of vehicles that are sent to us by their current owners. It’s worth mentioning because our bread and butter consists of selling the entire package – place an order on our website and we’ll deliver a newly built vehicle to your doorstep. In the case of “Contract Restorations”, we’ll sign a restoration services contract and we’ll coordinate to have your vehicle picked up and delivered to our shop. It returns back to you in “like-new” condition. We only provide full, frame-off restoration services, where we modernize core features of your vehicle. Your vehicle will be disassembled and rebuilt from scratch to the specifications of the vehicles advertised on our website here. We re-engineer the chassis, install a new suspension, new steering, new engine, new transmission, new wheels/tires, new wiring, new pumps, new pistons, new valves, new upholstery, etc. Although our core competence is working with 40 series Land Cruisers, we can do this on 20, 60, and 70 series Land Cruisers as well. We only provide one “level” of restoration and customization. That level is called “the best we can do”. We learn from each truck that we build and apply those learnings to the next one. Your vehicle will go through the same RestoManufacturing process as any of our other vehicles. In fact, most of our folks on the ground won’t know the difference between a customer-owned car or one we’re building on spec. We photo-document the process. We’ll do a photoshoot pre-restoration, during restoration, and a final one of the finished product. 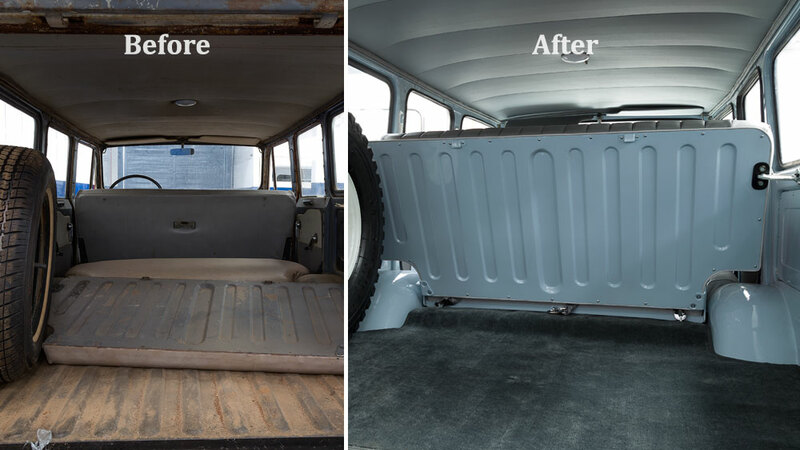 Check out the gallery of this FJ45LV for a good example of the photo-documentation process from start to finish. The pictures are posted monthly on our website and emailed to you so you can keep an eye on our progress. In the end, we’ll include them in a nice coffee-table book that is delivered along with your car. It’s a great memory to have of the work that went into the vehicle and it’s certainly a valuable piece when it comes time to sell it. Expect to spend $150,000 or more for your project. Some models are more challenging than others as is the availability of parts. Our pricing will reflect that. We will review pictures of your vehicle, understand its condition, price out the customizations you are interested in, and we’ll sign a binding, fixed-price contract. Payments are made in 1/3s. First payment when we sign, second payment when we start body paint, and a final payment when you have inspected and accepted the vehicle. If we find more rust than expected during the restoration, that’s our problem. Don’t worry about the logistics. We’ll coordinate to have the vehicle picked up (wherever it may be). It arrives in Miami for a pre-restoration inspection and parts procurement, and then it goes to our facility in Bogota where we perform most of the heavy-duty work. Months later, we’ll deliver it back to you inside an enclosed truck, wrapped up in a bow (only if you want the bow of course). Expect the process to take 12 to 18 months. We will be clear about timing going into it and you can expect the vehicle back as promised in your contract. Finally, we know that our services are not for everyone. But you can count on us to have the experience and passion to build your Land Cruiser beautifully. Shop around and understand what you’re getting into before committing to any one shop. Ask for references. Ask for pictures. Come visit if you want to. We’d love to meet you. This is our previous work. prev postWhat Should I Look for in an FJ Restoration? next post See you in Monterey! Hi Ray - we don't sell parts, but we find Specter Offroad to be a great source (www.sor.com). Hope that helps! Try also cruiser parts.net. Located in NH and I have dealt with them for over 10 years. Great source, reasonable and no availability problems for my FJ62. I have a 3bt conversion with no body left (rust), or what I call the rat sanctuary. Do you work on diesels, and do you work with Aqualu bodies? Yes, we work on diesels, and we can use Aqualu - but part of our specialty is restoring them in steel. It's a matter of client preference however. Your service is looking good difference between these two photo clearly shows that. Is there an option for gasoline or diesel engine in your restorations? Thank you. Yes, we use either a gasoline or diesel donor as desired by the client. As an example, here's a BJ46 diesel we restored a while back: https://www.fj.co/detail/1983-Land-Cruiser-BJ46_161. Hey guys, do you make chasis for FJ 47? Hi Bernard, no we do not. Hi John - we only perform full restorations, we do not do partial work. Have fun with your build!